L.A. 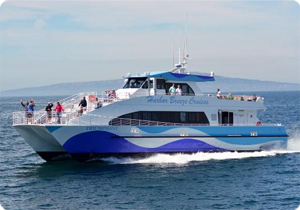 Waterfront Cruises is proud to run daily Whale Watching trips. During these two hour adventures we will be on the lookout for not only many species of whales, such as Humpbacks, Fin Whales, Killer Whales, and Minke Whales, but dolphins, harbor seals, sea lions, and seabirds. 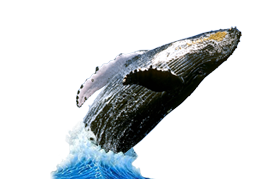 During our Summer season we embark on a search for the world's largest mammal, the Blue Whale. Whale Watchers will have the opportunity to witness Blue Whales along with other species of whales playing and feeding in the waters right off of the California coast. 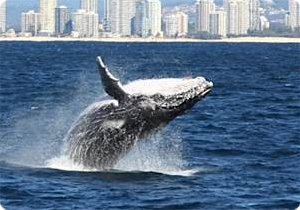 The Winter season is a special time to go whale watching as the magnificent Gray Whale migrates through local waters. This migration gives whale watches the opportunity to witness the whales on their incredible journey from the frigid waters of Alaska down to the warm waters of Baja California to give birth. If you're lucky, you'll even see a mother and a calf making their journey home back up the coast. The captains at L.A. Waterfront Cruises have a combined knowledge of 30 years and provide a full narration throughout the duration of the trip. Naturalists from the Aquarium of the Pacific will also be onboard to answer any questions about the wildlife seen on the cruise. Every boat has a galley aboard that sells hot and cold food along with sodas, water, and beer for your convenience. The inside galley has seating for 45 and the upper sun deck can accommodate up to 70 passangers. We hope you join us on the journey to see these wonderful creatures as they pass by the coast of Los Angeles! Group Rates: Call (310) 547-9916 for details. Please Note: Schedule and pricing subject to change with or without notice.